My final week in Brazil saw me where my heart feels the strongest – In the mountains. Many people think Brazil is all Amazonian Rainforest, due to TV documentaries and the environmental news it generates. However only 57% of the country is cover by rainforest, with the rest being grasslands, savanna, wetlands and mountains. There are many mountain areas, some climbing close to the 10,000ft (3000m) mark. Getting into them is a slow and arduous job, unless you have the nerve to drive out of Rio and into the hills. I’ve driven on the right before in Europe and Canada, but most people there tend to stop at red lights and stay in lane. The first lesson in driving in Rio is to forget this, drift everywhere, use you horn a great deal and drive like everyone is out to get you! Actually I never saw a collision as everyone seems fairly polite, but it is chaotic. The second lesson to learn is that road signs are few and far between. Navigation is either an art form or pure guesswork. I drove and Fiona navigated. After an impromptu two hour circular tour of the suburbs of Rio, we headed out into the Itatiaia National Park – the oldest in Brazil. The plan was to arrive early and check into the National Park before it closed. Due to our Whacky Races style journey (which should have been two hours, but ended up over six), it was pitch dark when we got there and the gates were locked. We spent the night camped in a lay by and were woken at 6am by early morning joggers. We both felt a little rough, but what is adventure without a little discomfort..? The day dawned brightly. but cloud soon hugged the forests. We entered the park (good job Fiona spoke excellent Portuguese) and spent the day exploring the dense forests. The rivers provided beautiful waterfalls and the trees were strewn with flowers, birds and monkeys. I’ve bashed through a great deal of jungle in my time across Asia and South America, so there was nothing much new here to me. What was new was when we entered the park from the other side towards the monstrous Pico das Agulhas Negras or Peak of Black Needles. 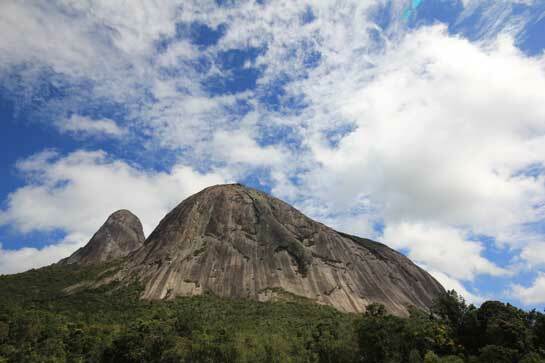 This mass of rock is the fifth highest in Brazil and towers over the landscape. 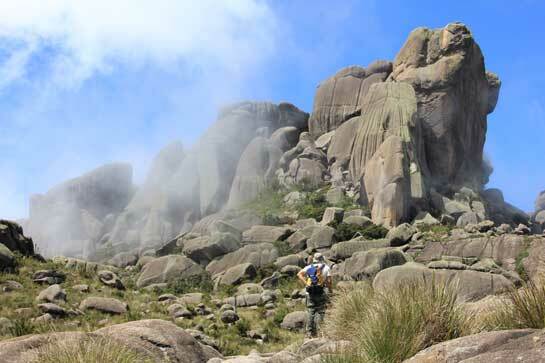 Feliepe joined us for the assault and we based ourselves in the remote Abrigo Reboucas mountain hut. A Portuguese copy of Joe Simpson’s ‘Touching the Void’ was sitting on the table. I produced a copy of ‘Once Bitten‘ and before I knew it I was a celebrity. Lots of translations followed, drinks were passed around and the party began. ‘So far so good’ I thought, but then a TV crew appeared! Suddenly I was being interviewed, with Felipe translating for me. The crew were from Globo TV International in Brazil – a huge broadcaster in South America and indeed worldwide. Usually, when I work in TV, I have prepared, dressed accordingly etc. Here I had about ten seconds to prepare, but experience paid off and I gave a great interview. The entire hut sat still and listened as I told my stories of adventure and disaster in the mountains. Big tip for anyone wring with the media – always be prepared for an immediate interview. Reporters can appear from anywhere and ask any question. Take a breath, think and give a fantastic interview..! The next morning we set off to climb the Pico das Agulhas Negras but something felt wrong. About two hours into the scramble the energy drained from my bones and my muscles began to shake uncontrollably. I could do nothing but sit down and rest. Fiona and Felipe continued, but my day was done. My aches reminded me of the time I suffered an appendicitis in Greenland, eight years ago. Fiona walked me down (and I needed her help), with Felipe joining later after his summit attempt. I was a mess, but something had been going round for a few days and it had finally caught me up. I rested for an evening in the hut and then it was time to move across Rio state to our final destination – the Tres Picos National Park. Below the Tres Picos lives Brazillian climbing legend Sergio Tartari with his wife Rosane. Sergio has pioneered many routes on the peaks and loves living in their shadow. He and Rosane run a climbing hut and make the most wonderful pizza (Sergio’s father was italian) and the best stout I have tasted in years..! There is an atmosphere of friendship and laughter in their community that is rare to see in this modern world. They know everyone and everyone knows them. Fiona and I spent a few days in the park and hoped to climb the smaller of the peaks, but overnight rain made the rock greasy and dangerous. The forests below the peaks are dense, full of wildlife and devoid of people. I had a slight altercation with a venomous looking snake at one point, but this is what adventure is all about! There was so much rock to climb, but these days I find that difficult work. My injuries play hell when I expose them to too much wear, which is why winter conditions suit me better, but just to be below these huge domes was an experience in itself. Great writing. Enjoyed reading about your adventure. Thanks for the advice about Nepal..